Ah, Garbo! Perhaps the most enigmatic performer ever to grace the silver screen, a strong, independent woman who rejected a number of marriage proposals from powerful men, yet shied away from the spotlight like a frightened lamb, demanding her privacy in an era when movie stars were treated like visiting royalty. It was an attitude that extended beyond her private life, encompassing the actress’s screen persona as well, and nowhere is this dichotomy better represented than in 1933’s Queen Christina, the story of a strong-willed ruler of men who, in turn, allows her own heart to be governed by love. Based on the life of a 17th century Swedish monarch, Garbo stars as the title character, Christina, who ascended to the throne at the age of five, her country engaged in a costly war. But as she grew, Christina clearly favored the classroom over the battlefield, and her policies would reflect these beliefs, leading to a period of peace that many in her kingdom did not desire. Once of age, the Queen was expected to marry her cousin, to whom she was betrothed as a child, but instead fell in love with Antonio (John Gilbert), a Spanish diplomat, sparking an affair that would change not only her opinion of men, but her very future as Queen. As happened with a good many films in the early ‘30s, the MPAAD kept a close eye on Queen Christina right from the get-go, warning MGM to avoid making any allusions, veiled or otherwise, to the real Queen’s alleged bisexuality. Naturally, the studio ignored these warnings, and while no overtly bisexual references are made in Queen Christina, such relationships are, at times, implied. Aside from the main character’s sexual orientation, the Hays office also objected to a scene set in the bedroom of an Inn, where Christina and Antonio had just spent the night together. Acting like a starry-eyed adolescent, Christina slinks seductively around the room, ‘memorizing’ every picture, shelf and bedpost so that she will always remember her romantic evening. The final straw, however, came when Christina, still on cloud nine as a result of her tryst, says, “This is how the Lord must have felt when he beheld the finished world”. While some chose to ignore Queen Christina’s more ’decadent’ moments, this line of dialogue, due to its ‘blasphemous’ nature, didn’t make it past state censors. 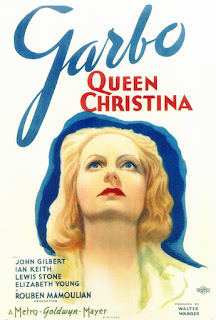 Controversy aside, Queen Christina remains a highly-regarded classic, and Greta Garbo is the reason why. A performer of incredible ability, she could evoke strength and frailty in equal portions, and quite often within the same scene. It's been a couple of years since I watched Queen Christina, but its still pretty fresh in my memory - largely because of Garbo. I recently began watching some of her silent films and was equally taken by her screen presence. Definitely makes me want to explore more of her work.